The BC industry is under a lot of pressure: unsatisfied clients, building frauds, costs of failure, nothing very optimistic to say it mildly. Improving the value adding performance of BC is the challenge . In BC, little value is added. There is, mostly, only a small difference between actual costs to build the product and value provided to the customer. Assuming that the price is set between the costs and the value, only little room exists for profit for the Virtual Enterprise that performs the project. Also, relatively little extra value is provided for the money spend by the customer. See figure 1.1. Figuur 1.1: Value, price and cost: with small margins, the Client doesn't get much added value compared to the price and the Contractor doesn't get much profit compared to the cost. Why is it that BC is not the powerful industry that it could be? Many reasons have been mentioned, i.e. uniqueness of the building projects , uniqueness of the acpluralVirtual Enterprise, fragmentation of the BC ISs , lack of strong market leaders besides the national and local governments, the fact that buildings and civil engineering products have to be build on-site, a strong focus on minimum price, and several more. The question is of course whether these reasons are cause or effect. Undoubtedly some external influences like bad weather or traffic jams are playing a negative role in the BC industry, but it is by no means clear that the value adding performance of the BC industry cannot be substantially improved. In fact the hypothesis of this PhD research is that ICT (and especially the Internet) can help BC to perform like any high-tech industry. The question is not if, but how. And it is this question--how can state of the art ICT help to improve the performance of the BC industry - that is targeted here. As said above, collaboration means information exchange or, more precisely, information and knowledge sharing. The following paragraphs discuss one-off prototype building and the desire by the customers to get more grip on the process and on the end result. Also a comparison with other industries is made, followed by a short discussion on contract characteristics. 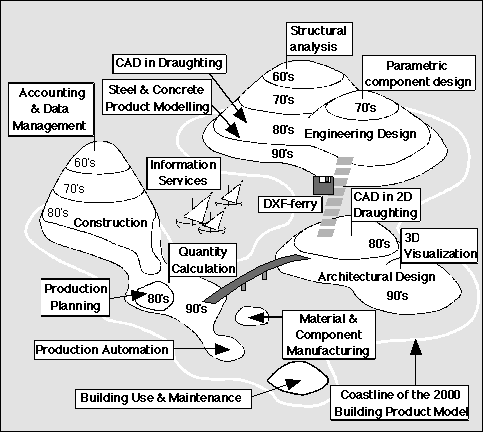 BC is often characterised as a collection of information islands  (figure 1.2). There are a lot of different parties: Clients, Contractors, sub-contractors, engineers, architects, (local) governments, specialists, the fire department. Also characteristic is a subdivision in disciplines: civil engineering, house building, electro-technical installations and so on. Everyone has their own systems, possibly even their own favourite separate Classification system3.2. This subdivision does not yet take into account the islands of information within actual companies. Are the designer, engineer and costing expert working with the same information? Above fragmentation prevents needed collaboration. Figuur 1.2: Islands of automation illustration, originally by Matti Hannus . This version is from Per Christiansson, http://it.civil.aau.dk/it/education/overview.html. It illustrates the various separate islands of automation while at the same time expressing the hope that the next level of technology can finally raise the land enough to merge the islands. Note that the figure slots that joyful moment for an arrival in 2000. The needed collaboration means there is a huge amount of information that needs to be communicated. Technical data is needed by the sub-contractors. Safety checkers need to be able to verify the correctness of technical data. The project planning must be communicated to every worker, taking the form of work orders. Also suppliers need to know when to deliver which goods. Regarding this information, current practice in the BC industry is mainly paper-based, though electronic communication is an alternative. If an electronic way of communication could reach the same level of trust and--also important--the same legal status, it could replace much of the paper-based communication, with the possible advantages of speed and accuracy associated with electronic communication. A second characteristic: a lot of work basically consists of prototypes. Unless entire city extensions are build in one go, individual projects are mostly one-of-a-kind. Cooperation is in per-project consortia (Virtual Enterprises). Third, there is a growing need for the Client to get more grip on the process. For large infrastructural works it is normal to greatly exceed the budget . There are also quality issues: the Dutch house owners' association VEH, for example, does a lot of post-building check-ups to find errors in brand new houses like missing doors, mis-aligned stairs. VEH finds, on average, 28 failures in any newly constructed house. Following from the nature of the industry and the wishes of clients, collaborative construction is important. There is a great need to communicate meaningfully between islands of information, exchanging information and knowledge in order to reach an improved and more effective cooperation. Regarding this communication need: the Internet provides a lot of possibilities for exchanging data and for structuring data. How to capture and use construction Semantics using NG Internet technology? What is the relation to existing approaches like Classification and PDT, does the web approach help to overcome their shortcomings?